At this point I’m pretty comfortable calling myself an expert on this topic. 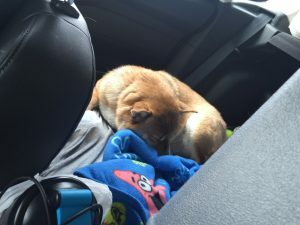 Add in numerous trips from North Dakota to Minneapolis, MN and we did well over 100 hours of driving with our fur baby. We also aren’t the type of people who stop for the night on our road trips which adds its own special challenges when traveling with a dog. So how do we make sure we don’t have a wild pup jumping around or even having accidents in the car? 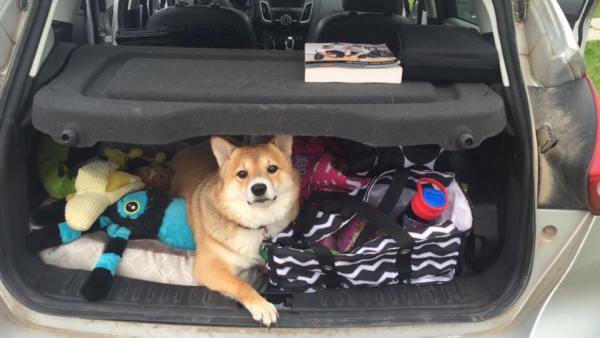 The longer the trip, the more stops to plan to make, especially as you get to the end of the drive since your pup will be more restless. If possible make sure your pup is exhausted when you are ready to go. 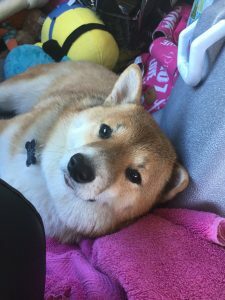 Weather you bring her to doggie daycare, a friend/family members house, or even play for awhile before you go this will make for a dog who will crash sooner and sleep for a good leg of the drive. Whenever you normally feed your dog is when you need to feed your dog on the road. If your pup is anything like mine she likes to stick to her routine or she gets a little(or a lot) grumpy. Sticking to the feeding schedule will also help to reduce accidents as you have an idea how long after meals before they have to go! We always have our fur baby’s favorite toys with us so she has something to play with. On the longer trips we also bring a bone of some sort so she has something to chew on to keep her distracted. This is especially important if you dog is normally a chewer because when they get bored on that drive they will need something to chew on and if you don’t provide it it could be your cooler, your luggage, or even your car. When you are making any stop its time for your pup to get out of the car and stretch their legs. For us that usually means walking/jogging around a rest area for about 10-20 minutes. Just be sure to make the best use of your time at each stop and get your dog active so they don’t go too wild in the car. Yep you read that right. This isn’t just for you but a courtesy to other travelers so they don’t have to walk through dog poo at a rest area. As much as you may love it when your dog comes and sits on your lap up front this one is for their safety. Restraining them to the back or setting up some type of barricade will keep them safely in the car.